Nestled between the Stara Plannina Mountain Range and beaches of the Black Sea coastline, Sveti Vlas dates back to the 2nd Century BC when it was a thracian settlement site called Larissa. Today, Sveti Vlas (Vlas) continues to maintain its village atmosphere and charm. It is home to many local shops and restaurants which all lead up to the "village square" where you can still sit and watch the locals go about their day to day lives. By night, Vlas comes alive with restaurants offering traditional Bulgarian food, many with stunning views over the bay towards Nessebar. Vlas is situated behind the resort and is approximatley a five minute walk from the apartment. Banking, Post Office and ATM facilities are all available in the village. Vlas has everything most families would like from their holiday - for those who do wish to venture a little further afield a car is not necessary because the area is well served by road and sea transport. Lazur 2 is ideally situated within the exclusive Dinevi Marina Resort in Sveti Vlas on the Black Sea coastline. The stunning Dinevi Marina is breathtaking and has hosted a variety of national events since opening in 2008, including the Boat and Motor Show and Miss Bulgaria. The Marina has a variety of restaurants, bars and boutique style shops - it is a great place to people watch. To complement the Marina, an ampitheatre was also opened in 2008 which hosts evening entertainment at least 3 times per week. Either side of the marina are beaches - one private (for those staying within the Dinevi Resort) and one public beach. Both beaches have a variety of watersports on offer. Although both beaches have good restaurants facilities - the cocktail bar on the Dinevi beach is a visit "must" to enjoy sipping a cocktail in opulent surroundings watching the sun go down. The Lazur complex benefits from full use of all the amenities available within the resort yet due to the smaller size of this complex it maintains the privacy and tranquility you require for a relaxing holiday. There are a number of small shops and a supermarket within a two minute walk of the apartment. The resort offers its own transport to Sunny Beach, Nessebar and Bourgas for a small fee - this transport runs approximately every hour. The resort is also well served by public transport which is very cheap, complex taxis are available and free buses run to the waterparks from the village. There is also a water taxi available from the marina over to Nessebar. The big WOW factor of this apartment is the balcony which comfortably sits six people for al fresco dining - the balcony then extends to accomodate 3 sun loungers which is ideal for those sunworshippers amongst us! The balcony overlooks the pool area and manicured gardens - due to it being a small complex it is not noisy. One full family bathroom, complete with shower and an additional wc. The apartment is situated on the 1st floor - to the right on the photograph. 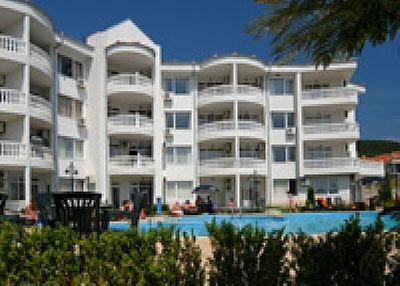 Superb, spacious two bedroomed apartment in the exclusive Dinevi Marina Resort. Fully airconditioned. Full family bathroom with additional wc. Enjoys first floor aspect from front and ground level to rear (bedrooms) - due to being built into a slope. Huge balcony !! !